We've purchased, so far, only organic oats and raw milk through them so I can't review all of their products, but that will most likely to change with time as our overall reaction to their farm is a positive one. The milk tastes like real milk. It's hard to describe except to say that it really feels like it has all the nutrients and taste that regular, store-bought milk sorely lacks. Oh - and it has a hand-written date on the glass bottle (with recyclable plastic top) of only six days from when it's delivered. Six Days! Isn't that great? I shudder when I think of how long conventional milk sits around during its collection and distribution processes. So, the whole ordering process is a very manual kind of experience, but you get used to it once you know the rules. 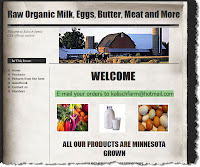 When I send emails to Kalisch Farm, I often do not receive a response if it's regarding an order. I would suspect that he's probably not on the computer a whole lot and that he's probably pretty busy handling everything else. If they would invest the time to streamline their website for ordering, customers would most likely feel a lot better about the process and they would regain a lot of time themselves, I suspect. Once in a while, perhaps as a result of the ordering process being messy or just by accident (who knows? ), orders will not actually come in. The first time I ordered, one of the products I requested wasn't delivered. One time, my brother's order never appeared, and I have seen other customer complaints on their website regarding this kind of thing happening as well. All in all, I think that as time goes by their order and delivery process will improve to match the excellence of their products and despite all the negatives even at this point, I still recommend Kalisch farm as a good source of real food. hey, id be careful about being too specififc about who youre buying milk from. Okay - I took out the first name in the post (although I realize that what's posted to the internet should be considered never fully erased, ever...) but I'd have to ask: why, in this case? All this information is publicly accessible right on their home page - even their personal email addresses are on their contact page. Thanks for this review. I think you were able to sum up the life of a farmer trying to make it in this world of computers... their website is not user friendly, no order form like you say, but I also guess they are always working to produce the food, not worrying about technology. Their experience is lacking in technology (email responses, if any, are slow). But I would rather have them focus on providing organic foods at a low price. All I know is that their raw milk is SO SO SO delicious, along with their organic meats. YUM!!! Yes, you're right, the life of a farmer is unknowingly busy to the people who aren't actually living it. I don't think I even emphasized that enough in this review. My brother grows organic crops and he's constantly working the grounds. I think what Mary was talking about regarding being careful about the specifics of who you are buying raw milk from is because of the laws about purchasing raw milk for human consumption. It is a very gray area here in MN. I started a fan page on Facebook for Kalisch Family Farms (please become a fan if you want) and someone emailed me saying he didn't think I should do that so the farm wouldn't get in trouble. I confirmed with Jay that it was ok, and that I don't want him to get in trouble with the law. He said no problem. Get the name out there. Let people know there are places where you CAN go to get good, wholesome organic raw milk. Thanks, Rebecca! It did dawn on me to revise this a second time since Mary commented, and I think it sets out the details that one could find out all on their own, using Jay's site & address.